British-Israel.us - Lesson 24 - Were ISRAELITES in India? Where did the lost Israelites go? Did they migrate to INDIA? Did they invent BUDDHISM? Israel was taken captive "unto Halah, and Habor, and Harah (Aria, Ariana, Arachosia, Harat) and to the river Gozan (Gauzanitis or Cyrus River)" (1 Chr. 5:26) "and in the cities of the Medes" (2 Ki. 17:6). These people were known as "the house of ISAACA" (Amos 7:16) since Genesis 21:12 says, "in ISAAC shall thy seed be called." There is an ISSYK Kul (Isaac's Lake) in eastern central Asia. But since the Hebrew alphabet was originally written without vowel points, there was no "I" originally. Strabo places these SACAE east of the Caspian. BENI-ISRAEL can be found in Hindustan also and on the borders of Burmah and Siam. SACAE seized Bactriana and about a century after Alexander they established their rule from the Aral Lake to the mouth of the Indus. They then invaded central India and fell under the dominion of the Parthians -- probably of the same race -- and finally were absorbed into the kingdom of the Sassanidae, also SACAE. The religion of these SAKAI, the SAKHS of Indian history, was BUDDHISM. The rock inscriptions, left in India and Turkestan by the early founders of BUDDHISM, were HEBREW. The Hebrew root BUDDH means "ALONE" (used of Israel in Hosea 8:9). "BUDII" means "the SEPARATED people" and occurs as a tribal name both in ancient MEDIA, and in connection with the SCUTHS in Europe. Were Two Ephraimite Branches Called Budii? Herodotus says that the BUDII were a tribe of MEDIA (Herod. 1:101). Herodotus also mentions another branch of the BUDII as a great and populous nation amongst the SCYTHIANS who had adopted SCYTHIAN customs (4:108). These BUDII were probably two branches of Ephraimites because Hosea 11:5-6 says Ephraim "shall not return into the land of Egypt, but the Assyrian shall be his king, because they refused to return. And the sword shall abide on his cities, and shall consume his branches (Heb. "BADDHAI"), and devour them (the BADDHAI), because of their own counsels." The SACAE and BUDII moved east into northern India about 60 years after the Scythians had overrun Media and Mesopotamia -- about 625 B.C. They may have become RAJPUTS and BRAHMANS. The worship of cows was the sin of Israel (1 Ki. 12:28) and they brought it with them to India. The BRAHMANS have among themselves TEN distinct classes, or rather nations.... One hundred miles northeast of Benares, at Kapilivastu, on the banks of the river Rohini, the modern KOHANS, there lived about 500 B.C. a tribe called SAKYAS (Saxons).... Gautama (lord Buddha) had many titles, one of which was SAKYASHINA. He was also called 'the LION of the tribe of SAKYA, SAKYAMUNI, the SAKYA Sage, Sugata the Happy One, Sattha the Teacher.'" This Buddha is called MAGA (a Magian) by the Burmese and in Burmah, Arracan, Ceylon and Siam the sacred language of Buddhism is called the language of the MAGI. The priests of the Bactrians, Chorasmians, Arians and Sacae were called MAGI (Asiatic Researches 11:76-80). When SAKYA died, those who especially honored him were the SAKYAS of Kapilivastu, and they did so saying, "The Blessed One was the pride of our race" (of Saxons). The religion of these SAKAI, the SAKHS of Indian history, proves to be BUDDHISM. The rock inscriptions, left in India and Turkestan by the early founders of BUDDHISM, prove to be HEBREW. Did the Bible Predict BUDDHISM? About 760 B.C., Amos 8:10-14 says, "I will turn your FEASTS into MOURNING, and all your SONGS into LAMENTATION; and I will bring up SACKCLOTH upon all loins, and BALDNESS upon every head; and I will make it like the MOURNING for an only SON, (Gautama Buddha) and the end of it like a BITTER day. Behold, the days come, saith the Lord God, that I will send a famine in the land ... of hearing the words of the Lord. And they shall wander from sea to sea, and from the north even to the EAST( in India), they shall run to and fro to seek the word of the Lord and shall not find it. In that day shall the fair VIRGINS and YOUNG MEN faint for THIRST. They that swear by the sin of Samaria, and say, By the life of thy God Dan! And By the life of the way of Beersheba! They shall fall and rise no more." When Israelites became BUDDHISTS, all these predictions were literally fulfilled. Buddhist festivals are full of MOURNING. Their songs are LAMENTATIONS. All devotees to Buddha adopt SACKCLOTH as their clothing and they all make themselves BALD. BALD-headed devotees of Buddha are Sons of SACKCLOTH and the ordination of the priests is to this day a refinement of AUSTERITY since, according to the Karma Wakya, or Book of Ritual, they are required to wear a robe of FILTHY RAGS, and subject themselves to every form of DEGRADATION. Vows of CELIBACY by Buddha-worshippers in many parts of the East are well known. Indeed, in all countries professing Buddhism, priests are sworn to a life of CELIBACY and the number of NUNS is enormous. This is why the young men and women "faint for thirst." Dan is one of the three names of Buddha given in the inscriptions both at Girnar and Delhi (cp. Amos 8:13-14). Isaiah 3:24 says, "it shall come to pass, that instead of sweet smell there shall be STINK; and instead of a girdle, a ROPE; and instead of well-set hair, BALDNESS; and instead of a robe. a girding of SACKCLOTH; and BRANDING instead of beauty." Ezekiel 7:16-18 says, "They that escape ... shall be ... MOURNING, every one for his iniquity.... They shall also gird themselves with SACKCLOTH, and HORROR shall cover them; and SHAME shall be upon all faces, and BALDNESS upon all their heads." The word for "mourning" in verse 16 is "homoth," the plural form of the initial word of perpetual BUDDHIST prayers. Without this word all their MANTRAS and incantations would be deemed unavailing. "Mourning For an Only Son" -- Buddha? The rock inscriptions of early BUDDHISM are one great cry of desolation, of ruin ever present and all hope gone. The founder of BUDDHISM was a prince of the SAKAN race, himself bearing the name of SAKYA, or more fully SAKYA Muni. Born in India about the year 618 B.C., at an early age he had risen to be prince of the surrounding peoples, preached for 40 years about charity and chastity, overturned many tyrannies, declared equality between high and low caste and founded hospitals and raised women to equality. Furthermore, he taught the coming of a seed of a woman of the SAKYAN race, who would crush the serpent's head and bring peace to the world. He remodeled the languages by compiling new Sanskrit and Pali grammars incorporating HEBREW in Pali form. After his death idolatry and innovations crept into BUDDHISM making it a poor reflection of what the SAKYA had taught. The Union Jack & Star-Spangled Banner? Some of these SAKAI and BUDII came south. These left a curious rock carving (see picture above) on the gates of the large tope at Sanchi, or SACHI, called the Star Banner. This banner, composed of two UNION JACKS, one above the other on the right and a banner of STARS on the left, surmounts the LION and UNICORN with a shield or UNION JACK between them. This Sachi is 20 miles north-east of Bhopal, and the device goes back to 300 B.C. This is an ancient forerunner of the Star-Spangled banner and Union Jack. 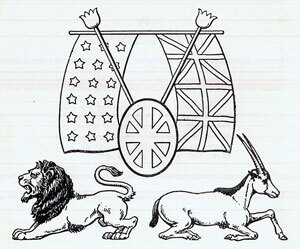 Balaam compared Israel to a "UNICORN" and a "LION" (Num.23:22; 24:8) which foreshadows the heraldic coat of arms of the British Empire. The STARS represent the TRIBES of ISRAEL (Gen. 37:5-11) and the UNION JACK symbolizes Jacob's CROSSED hands (Gen. 48:14). George Moore's The Lost Tribes explains that a joint army of SAKHS and YAVANAS (Greeks) under Alexander the Great (possibly an Argive DANITE) entered India and mentions the subsequent SAKAN conquest of the Panjab, the connection between the SAKAI and the two great PARTHIAN dynasties, that of the Arsakids and Sassanids, each of which defeated the armies of Imperial Rome periodically. Then the survival of the SAKAI themselves through the KHOZARS or Kosi of the dark ages, to the ruling AFGHANS of the present day. The so-called Tatar dynasty of the KHOZARS, who, leaving their homes on the edge of the Caspian Sea, became the lords of central India from the sixth century to the tenth, are the link between the SAKHS or SAKAI of the older area and the modern descendants in Bokhara and Afghanistan. Dr. Moore says, "Their sovereigns had, as early as the tenth century, been from time immemorial HEBREWS." But apart from this historical link, there is abundant evidence as to the ISRAELITE origin of the AFGHAN PATHANS. They resemble the HEBREW family. The AFGHAN PATHANS have always called themselves BENI ISRAEL, still all the while expressing contempt for the JEWS. Among their tribal names are those of YUSSUF-szye (tribe of JOSEPH) and IZAK-szye (tribe of ISAAC). Moreover, HEBREW names of places and persons are very numerous. These names existed before the Afghans were Mohammedans. They call themselves Pathan not Afghan. Their language known as Pushtu, is said to contain more HEBREW roots than any other. The name CABUL (applied to the capital, the river, and the nation of the Afghans) was anciently spelled CABURA, the phonetic equivalent of HABOR. Near CABURA, Ptolemy places a nation called Aristophyli or "the Noble"dated 100 B.C. Inscriptions at Girnar and Delhi have the names DAN, SAK and GOTH upon them. On the wall of a rock temple in Kanari, about 20 miles from Bombay, a Hebrew inscription with Pali characters, occur the names SAKA, DAN and GOTHA in connection with the devastation wrought upon them by Cyrus. "The SACAE and the GETAE who formerly invaded India sprang from the same source as the SAXONS and GOTHS of the West, and were directly connected with the Israelites, or with a people who employed their language." (p.95, Moore's Lost Tribes). The original of GOTH has been stated by Ortelius to be GAUTHEI, because "the ten tribes were jealous for the glory of God" (Sailman's Researches in the East). Were Confucius, Zoroaster & Cyrus Israelites? Further east in China, CONFUCIUS was born in 584 B.C. He denounced vice and immorality and preached pure religion. "To treat others according to the treatment which they themselves would desire at their hands," "To guard their secret thoughts," that "true renown consists in straightforward and honest sincerity, in the love of justice, in the knowledge of mankind, and in humility" -- such were some of his instructions to the Chinese. He advocated the "LAW of RETALIATION" so prominent in the Mosaic code and he is called to the present day "The most holy teacher of ancient times." The "Narrative of Eldad the Danite" (ninth century A.D.) says some of the ten tribes reached CHINA. Did they teach CONFUCIUS? ZOROASTER was the lawgiver of the Medes in 600 B.C. CYRUS who founded the Persian Empire and was called the "SERVANT of the LORD" to restore the Jews and whose work was foretold in prophecy, was also probably SAXON. God chose only one people to be his servants and witnesses to "shew forth his praise among the nations" (Isa. 43:21). "You only have I known of all the families of the earth" (Amos 3:2). Therefore, "in thy seed shall all families of the earth be blessed" (Gen. 18:18).